You have an opportunity to help Loudoun County Supervisors decide which highway and road projects to submit for funding from the Virginia Department of Transportation. The Board of Supervisors has 18 potential projects to choose from and may only submit funding applications for 10 of these projects. You can help them decide by taking an online survey between now and June 15, 2018! 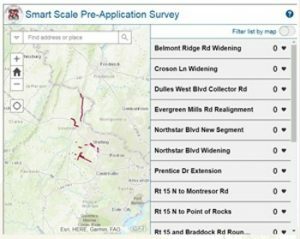 Visit www.loudoun.gov/SmartScale to let Supervisors know which roads you want improved. The website also has an interactive map and brief descriptions of each project. Click here to learn more about the Virginia Department of Transportation funding program and application process.